On occasion a person asks me for help with a problem on their computer. They can’t install Adobe Flash, other programs or are unable to make an important system setting change. I try to help them out with no luck. Then they send me a print screen image snapshot of the error message on their screen. After viewing the print screen image the problem and solution is very clear. [adblockingdetector id=”1″]The reason people have problems installing programs or making Windows system settings changes is because they are using a Standard user account in Windows. 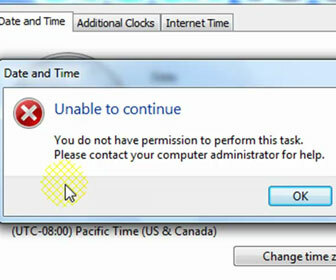 They can only perform their desired task using an Administrator user account. Standard user accounts are limited on what tasks they could perform. Standard user accounts cannot install programs or change most system settings. You cannot use Windows Update to update Windows if you are a Standard User. Standard users still have full access to the Internet and any program already installed on the computer. In contrast, Administrator user accounts are able to do anything, there are no restrictions. So if you need to install a program, change the time and date or change an important system setting then you must log into an Administrator user account. Note: The video tutorial below was recorded in Windows 7. The restrictions and methods of checking if you are using an Administrator or Standard User account are very similar in Windows XP and Vista. The video will still be valid if you are using the older XP or Vista.